Bombil or Bombay duck is a delicate fleshed fish with just one central bone. The bones are very delicate too and can be chewed on when the fish is fried crisp.Not to mention that the fish turns to a melt in the mouth texture when fried crisp with a coating of seasoned rice powder. It would be the best fish fry for you if you love a crisp exterior and melt in the mouth inner parts. The reason why the fish is liked in the fried form mostly. 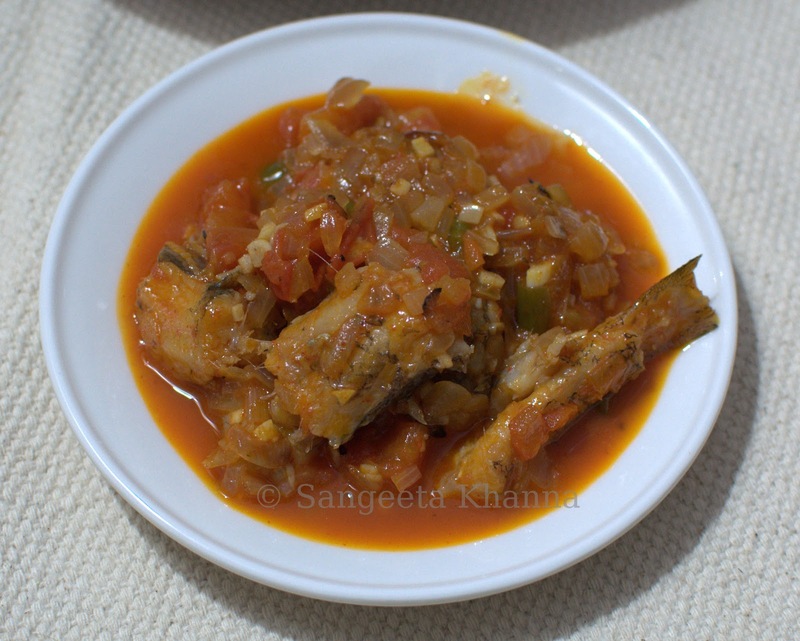 But I love a simply seasoned tomato based curry with this fish too. The fish is poached in a chunky tomato gravy and turns buttery after cooking. 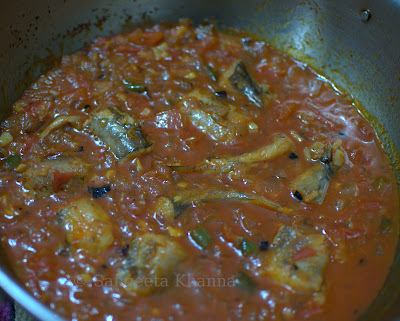 You can poach a few Bombils in a ready to use tomato garlic sauce too, especially if the sauce is not too spicy. Heat the oil in a wide bottomed pan and tip in the garlic and fry just for 30 seconds or so. Do not brown the garlic. Add the onions and green chilies, mix well and keep cooking after adding salt. Once the onion is softened and lightly pink, add the tomatoes and the red chilly and turmeric powder too. Stir and cook till the tomatoes are mushy. Add about 3/4 cup of water and let it boil once. Add the cut fish as soon as the tomato mixture starts boiling. Cover and simmer the mixture for about five to seven minutes. Check if the fish is done and the sauce has thickened well. It will be a chun ky sauce with melt in the mouth texture of fish. If you want a smooth gravy, just blend the sauce after it gets a boil, pour back into the pan, add water and simmer with added fish till done. No herb is required in this curry but curry patta, coriander greens or a hint of thyme can be a good thing to add when you feel like. 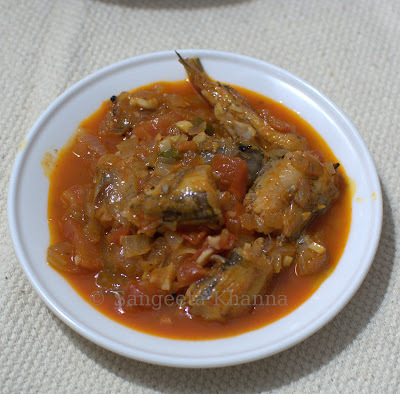 The buttery melt in your moth texture of fish with this mildly flavored soupy sauce can be a meal in itself. Or just have a little plain boiled rice with it.